How do I use a Chimpy? What advantages do I have when using a Chimpy? Which devices can I charge with a Chimpy? Do I have to turn on the Chimpy before I can use it? How much power does a Chimpy have? Where can I rent a Chimpy? When do I have to pay and how? Do I have to register myself as a user to rent a Chimpy? How long can I keep the Chimpy? Are the charging cables included when I rent a Chimpy? If so, which ones? How do I configure Chimpy Premium? How do I rent a Chimpy with my SwissPass? 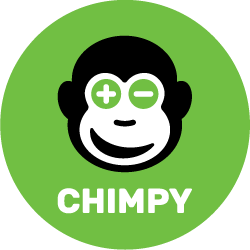 How can I cancel Chimpy Premium? What advantages do I have when using the App? Why do I have to enter my credit card data? The Chimpy is not charging my phone properly. What can I do? The Chimpy or its cable doesn’t work because it is damaged. What can I do? The Chimpy charges my phone only partially, not 100%. What is the reason for this? I am a registered user. But the QR-Code is not recognized at the selling-point. What can I do? The battery of my Chimpy was already empty when I picked it up. What can I do? The message “This accessory may not be supported” appears on my iPhone. What can I do? Can I recharge the Chimpy by my own? Why do I act environmentally sustainable when renting a Chimpy? Who and what is behind Chimpy?